Over the last two years, I’ve taken dozens of people’s pictures with my I Love Memphis sign. 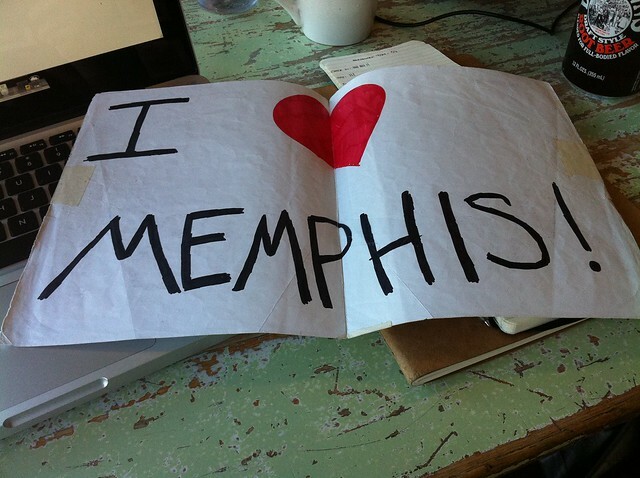 It’s nothing fancy – just a sheet of 8.5 x 11 printer paper with “I (heart) Memphis” scrawled on it in Sharpie. The paper has started to soften on the sides from being held so much. It has a giant crease down the middle from being folded in my notebook. It’s held together with tape. 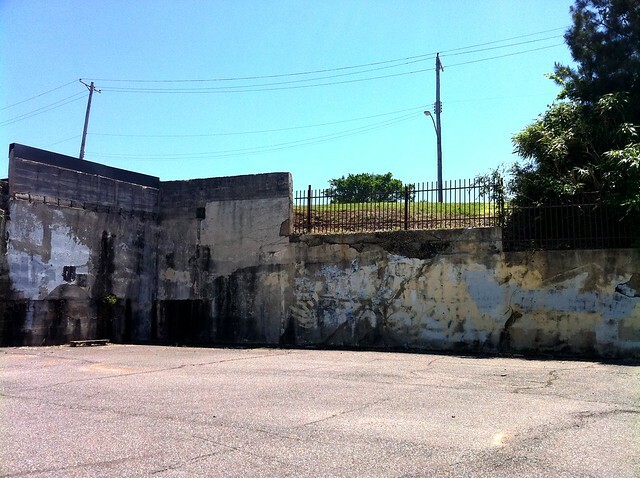 Through a joint effort of my office (the Memphis Convention and Visitors Bureau), the City of Memphis and the Urban Arts Commission, this retaining wall in Cooper Young is going to be transformed into a giant replica of the I Love Memphis sign. And it’s only the first one. By mid-summer, there will be ten unique “I Love Memphis” signs painted by talented muralists all over town. Some of the murals will be designed by artists in the Urban Arts Commission’s mural program. Others will be publicly submitted designs. The first one is being painted on the retaining wall at the fancy train trestle in Cooper Young (facing Central) by the lovely and talented Brandon Marshall. It’s going to be finished next week. To kick off the project, we’re having a big party in the parking lot next to the mural on Thursday, May 12th from 4 p.m. – 7 p.m. There will be live music from the Wuvbirds, dancing by the New Ballet School, food and drinks, and plenty of giant post-its so that you can write the reasons you love Memphis and stick them to the wall. I’ll also be giving away a pair of Wanda Jackson tickets and announcing how to enter the public-submitted design contest. But mostly, I want you to come and take your picture with the sign. You can even hold the little one in front of the big one if you want to. Very cool. The CYCA has covered graffiti on that wall numerous times over the years. Hopefully a good mural will discourage more graffiti. Thanks, Kerry! This is awesome! Proud to be a Memphian! Have the other locations been decided? What about letting Memphians nominate and/or vote for the locations, really showing what people love most about Memphis? I am super excited to come I will bring my camera and take some photos you have really made me realize how amazing Memphis really is!!!! As a CYer and someone who loves Memphis, I’m very excited about this project. Our city needs more public art. just got back in town….will you be out there any other time…or only today? What a great thing for our city and a very positive image for all to see. excellent post i ♡ memphis! What a great idea!! I love it!! How fun to see this happen! Love this creative city !! Wonderful idea! I’ll plan on being there and bringing a group of Memphis lovin’ friends. You don’t have to currently reside in Memphis to love it. I’ve been away for a very long time and still have “Memphis Pride”! utterly fantastic! i have an idea for an awesome “I Love Memphis” mural. How do I get more involved? I’ll post the details of the public design contest next week. i cannot wait! i would like to do a mosaic of the design out of plastic bottle caps, large scale. i am also trying to get the message out there to the people of memphis that plastic bottle caps are not recycleable and that plastic bottles with the caps left on do not get recycled- they get sorted out of the recycling facility and sent to the landfill as trash. i have been wanting to do some kind of large scale art project with collected caps for some time and this sounds like something that could turn out really cool. i think that memphis is becoming so much greener all the time and part of the green push we are seeing is fueled by a deep love of memphis! it’s so simple and fantastic. i am excited to hear more details of the public design contest as they are available and will definitely be there for the may 12th kickoff party!